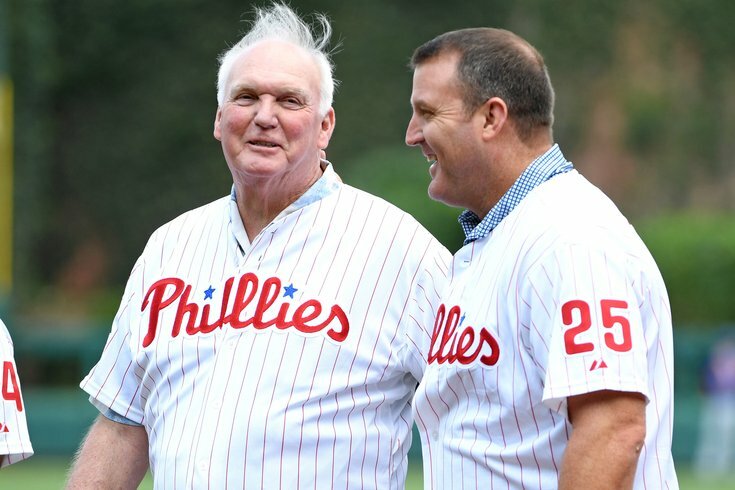 Former Philadelphia Phillies manager Charlie Manuel and first baseman Jim Thome. Ex-Phillies first baseman Jim Thome, who spent four of his 22 MLB seasons in red pinstripes (2003-2005, 2012), has been elected into the Baseball Hall of Fame in his first year on the ballot. He joins Chipper Jones, Vladimir Guerrero and Trevor Hoffman as part of the 2018 class, which was revealed on Wednesday. Thome retired in 2012 with 612 home runs (8th all time), 451 doubles, and 1,699 to go with a .276 career average. In his time with the Phillies, Thome drove in 281 runs and hit 101 home runs, including his milestone 400th. But Thome's impact on the organization goes well beyond the stats he posted. After 12 seasons in Cleveland, Thome joined the Phillies prior to the 2003 season and was the first big-name player signed by a rebuilding club that was looking to take the next step, not unlike the current situation in which the team finds itself. He also played a pivotal role in the hiring of Charlie Manuel, whom he knew from his time with the Indians. After three seasons with the club, Thome bounced around from the White Sox to the Dodgers to the Twins, and then finally returned briefly to the Indians. The following season, 2012, the Phillies resigned Thome. And while he only played in 30 games for the Phils that season, he did set a new record for the most career walk-off home runs (13) when he sent career homer No. 609 into the seats at Citizens Bank Park. Thome was inducted into the Phillies Wall of Fame 2016. “Jim and I enjoyed many memorable moments together, not the least of which was when I ‘passed the torch’ to him when we closed the Vet. That was a moment I won’t soon forget. When Jim came to the plate, nobody went to the concession stand. "Behind the scenes, Jim has an upbeat personality and what I always admired about him was that he was always willing to listen and wanted to learn from others despite how much he had accomplished. He would always pick my brain and loved to talk hitting, which was a byproduct of his unique relationship with Charlie Manuel. “There’s no player more deserving of a first-ballot Hall of Fame selection than Jim Thome. His stats speak for themselves, but they only represent one layer of his HOF credential. Jim is a tremendous person and family man, and he was one of the all-time great teammates. Jim’s signing with the Phillies accomplished a great many things for the organization. "First, he made us a better team. He gave us the opportunity to develop Ryan Howard at the proper pace. His clubhouse presence among a lot of outstanding young players allowed them to learn how to handle the pressures of the game. In a global sense, his signing validated and reinforced the promises we made to our fans about being fully committed to use the resources of a new ballpark to build a championship-caliber organization. And, he just happened to open the door for us to hire the winningest manager in Phillies history: Charlie Manuel. “Sharing the clubhouse with Jim not once but twice was an honor. His infectious smile, gentle nature, and the extra-large and tight hugs he’d give his friends because he was genuinely excited to see you were things I looked forward to every day. He made me strive to be a better player every day with the hope being he didn’t feel like he had to do it all himself. I just wanted to be a part of his legacy, not for bragging rights but simply to know what it felt like to stand so close to greatness!